A minor solar wind stream flowing from the indicated coronal hole could reach Earth on Oct. 7th or 8th. Credit: NOAA GOES-13. Autumn is here, and it's a wonderful time for stargazing. Find out what's up from Spaceweather PHONE. SPACE HOTEL: An unusual spacecraft is orbiting Earth: Genesis 1. It's the first room of a prototype space hotel under construction by Bigelow Aerospace. On Oct. 1st, Thomas Dorman saw Genesis fly over Horizon City, Texas. "It was easy to see with the naked eye," says Dorman. "I made this video of Genesis flying by the bright star Capella--a very pretty pass of the room with a view." This unusual image was created by French photographer Ivan Goncalves. He made it by stitching together strips of dawn from photos he took of ten different lunar phases. Call it the "full Dawn Moon." 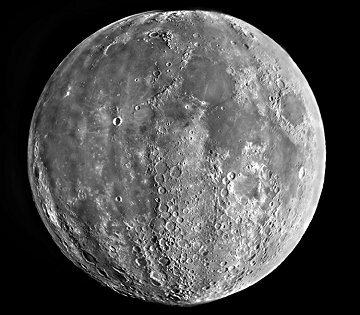 The full Dawn Moon is the same Moon we see every month--same mountains, same craters, same lava seas. Yet it looks strangely different. Two nights from now the full Harvest Moon will appear. Save this photo and compare the two. 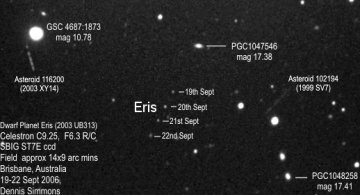 CROWDED SPACE: Last month, Dennis Simmons of Brisbane, Australia, decided to photograph the dwarf planet Eris (formerly known as 2003 UB313). He did that--and more. His final image, consisting of exposures spanning four nights (Sept. 19-22), revealed "a smorgasbord of exotic astronomical objects." Dwarf planet Eris, the view through a 9" Celestron telescope. "There are five PGC galaxies in the image, three of which are labeled," says Simmons. "A couple of asteroids also made a cameo appearance: 2003 XY14 on Sept 20th followed by 1999 SV7 on Sept 22nd, passing silently through the field while I was imaging Eris." Finally there is Eris itself, nine billion miles from the sun but still visible from Brisbane. Who said space is empty?